I was recently given an opportunity by Wizards of the Coast to come up with my own ideas for a DnD-themed webcomic. I’m not sure exactly what their plans are for this new section but it appears they’re simply getting a bunch of artists together and gauging which makes an impact. Here is the full list of artists and comics published so far. The idea I came up with is a small group of wannabe heroes who sit in a tavern watching adventurers coming and going. They’re basically dumb, unskilled villagers who dream of glory but have no idea where life is leading them. The strip is called “Life at the Top”, though I neglected to incorporate the title on my pages. My first two pages introduce two of the main characters (a gnome and a dragonborn), setting up their relationship and personalities. Each page is a simple standalone gag but if this continues, I’d introduce their peers and a few storylines. For what the commission called, I spent far too long on these (about three days each). As you can see, they ended up more like graphic novel pages than syndicated strips. Time will tell what comes of it (if anything) but as comics were my first love, I really enjoyed doing these and hope something happens. In the meantime, you can help out by using the Tweet and Like buttons at the bottom of those pages. Awsome! Funny and excellent! Adam, what software did you use to make it? oh sorry I forgot to mention in the post. I did these with ToonBoom Animate Pro 2. Haha!~ I especially like the second one–I laughed out loud. ^_^ Great work as usual Adam! I’ve been a long time fan of any type of comic book reading and that’s why whatever you written here about DnD-themed webcomic idea seems to me really admirable and i hope every comic lover will also love your provided idea. Thanks pal. Great comics! You should seriously consider to continue doing that. 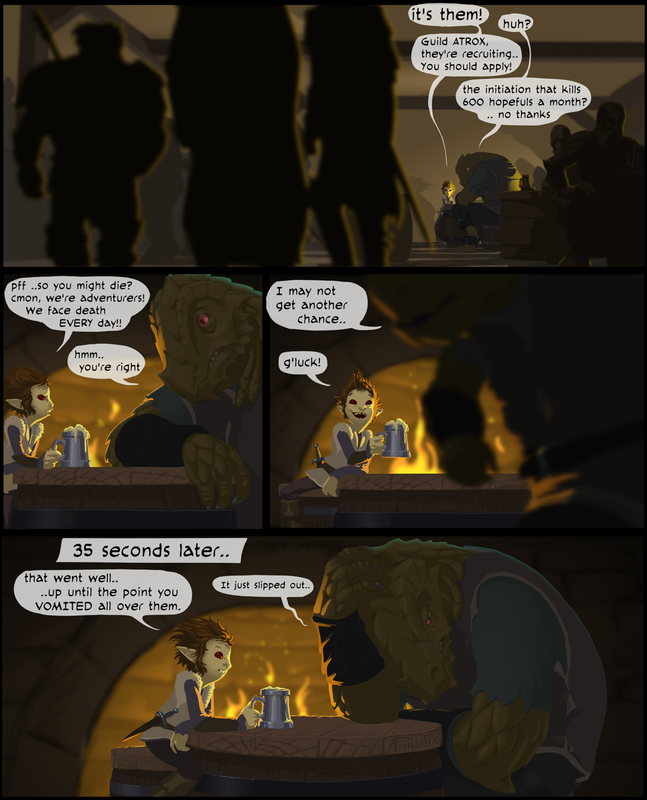 I love the idea of a Dragonborn with nerves so bad that he throws up. Your gnome looks a bit like Stitch from Lilo and Stitch. Very much so… Did you have anything to do with that movie? I played a lot of DnD some years back and i always spent a lot of time drawing my character. I think it was half the fun. You should make more of these. Or an original web comic. I would love to read them.